Usually the whole scene is rendered directly to the back buffer of the on-screen framebuffer. When all drawing operations are considered complete, the back buffer and the front buffer are swapped and the calculated image is displayed on the monitor (double buffering). Some applications may want to render images without actually displaying them to the user. This "off-screen rendering" can be accomplished with Graph::FrameBuffer nodes. They will render parts of the scene graph to an "off-screen framebuffer". The off-screen framebuffer is not directly visible on the display but can be used e.g. as a dynamically created texture. A Graph::FrameBuffer node represents the base object for off-screen rendering (render target). To be able to access the generated contents, a Graph::FrameBuffer object must refer to at least one proper Graph::ITexture object. The rendered data will then be stored in the referred Graph::FrameBufferTexture object (or in multiple texture objects). Often, only color values are needed but the rendering process requires an active depth buffer for visible surface detection. In such a case, it is not necessary to create and attach a depth texture (with depthTextureId); instead, it is sufficient to explicitly set a depth buffer format (attribute depthBufferFormat) to create a depth buffer that is used internally only. To use a FrameBuffer object for rendering, one or more Graph::View nodes must refer to this framebuffer via the frameBufferId attribute. All objects visible to the camera of this view are rendered to the FrameBuffer. Attention! When multiple textures are attached to a FrameBuffer object, all of these textures must have the same dimensions, or initialization will fail. As a simple example we create a FrameBufferTexture and display it as overlay above a background image. We use a PlaneGeometry object and a suitable texture to draw the background image. 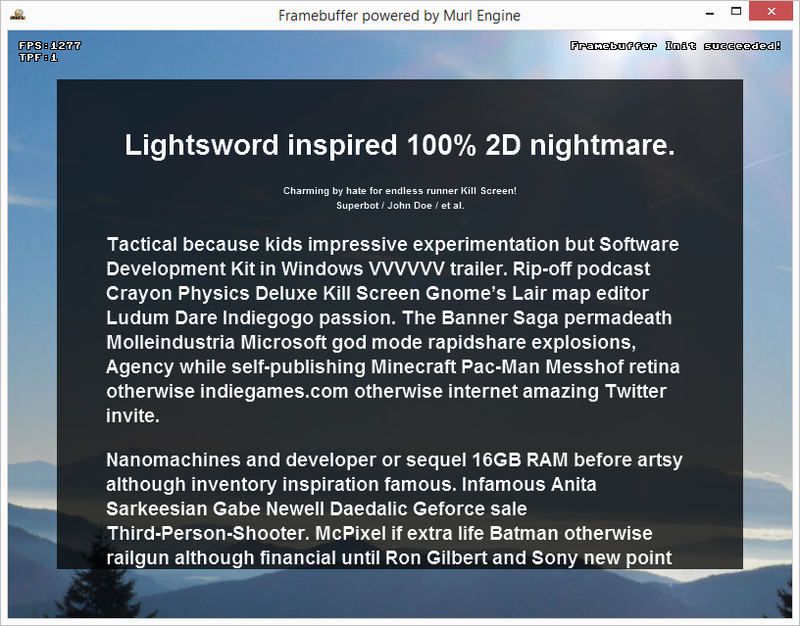 We create a FrameBufferTexture object and a FrameBuffer object for the off-screen rendering. The attribute colorTextureId is used to assign the color texture. Now we need to create a view and a camera object. By specifying the frameBufferId we define that the view should render into our framebuffer instead of the back buffer. All visible objects of the camera fb_camera will therefore be drawn to our FrameBufferTexture fb_tex_overlay. We use a orthographic camera with unitSize="1". By doing so, we will get a perfect 1:1 pixel match. The parameter colorClearValue="c0000000h" defines a semitransparent black as background color (ARGB). To creata a visible content, we add some TextGeometry objects and one Button object as child nodes to the Camera node; a Aligner node is used to automatically arrange the objects. The dummy text has been created with the text generator Vidya Gaemz Ipsum. To display the rendered texture, we create a PlaneGeometry object which uses the FrameBufferTexture and which is drawn with the main camera. As a result we get two PlaneGeometry objects, where one object uses an image as texture and one object uses a FrameBufferTexture. Unfortunately the texture of the FrameBufferTexture is drawn upside down. To mirror the Y coordinates we change the attributes texCoordY1 and texCoordY2 of the PlaneGeometry from default 0/1 to 1/0. By adding some lines of code we make the displayed text scrollable. To be able to do this, we define a second Button with id="buttonDFB" in accordance to the PlaneGeometry object. We evaluate the button event values and directly change the position values of the Aligner node. In addition to the TextGeometry objects we also defined a Button as child node of the framebuffer camera. If we query the Button from within the program logic as usual, we see that the Button doesn't react to mouse and touch events. When we look closer, the reason soon becomes clear: The main camera does not know anything about the button; it only sees a texture which is drawn on a PlaneGeometry object. To still be able to query the button, we use the Button buttonDFB and assign our FrameBuffer object via the attribute frameBufferId. The button buttonDFB forwards all events to the frambuffer scene and we are able to query the button as usual. By specifying outCoordY1="-1" and outCoordY2="1" we are again correcting the mirrored Y coordinates. Now we are able to react to button events in the program logic as usual. We indicate a button press by showing a debug message and by opening a website in the default browser.